Ribs are an essential summertime food. Honey chipotle ribs are sweet, spicy and absolutely delicious. Pork spare ribs are seasoned simply with salt and pepper and basted with the marinade throughout the cooking process. After almost two hours, the meat should be falling off the bone. You can cook these ribs in the oven , or if you prefer, the grill. 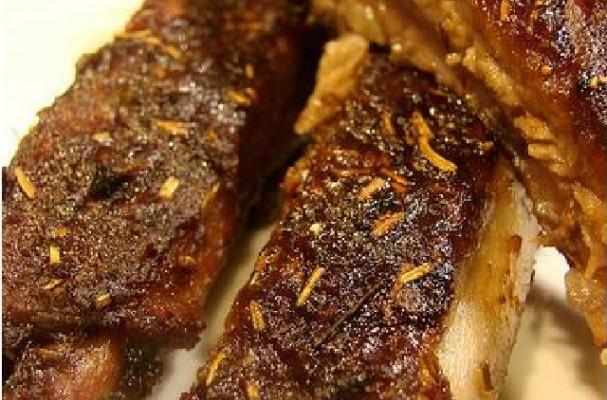 Honey chipotle ribs are a dynamite recipe that you'll want to prepare at every cookout. After you have seasoned the ribs, mix the ingredients for the sauce and set it aside. Preheat oven to 350°. In order to cook the ribs in the oven, you need a steam tent. Cut 2 pieces of foil paper the length of the rack. Line both pieces together and fold the seems together to about 1/2-in wide. Then fold again, the objective is to seal it so you have no leaks. Use a cookie sheet or a baking pan, place the foil tent over it. Rub 1/2 of the sauce over the ribs--both sides. Place the rack on the foil tent, and seal the top of the tent folding it the same way you sealed the bottom. Place it in the oven and allow it to steam for 90 minutes. Now forget about it! At the end of 90 minutes, pull out the ribs and carefully open the top of the tent. Remember there's a LOT of steam in there, don't burn yourself. The ribs will be cooked through, but not quite falling off the bone yet. Baste the top with the rest of the sauce, loosely close the tent and allow it to cook for another 15 minutes. After that time, open the tent and allow it cook uncovered for 15 more minutes. This last step will caramelize the sauce and make the ribs nice and sticky. You're done! Start eating! They go divinely with potato salad.